Highlights – Mind-blowing turquoise lake surrounded by towering peaks. A trip to Lake McDonald is a must for anyone visiting Glacier National Park. It’s the largest lake in the park and is a stunning sight, with its pristine glacial waters reflecting the blue dome of Montana sky and the craggy, snow-capped peaks that surround it. Sure, I might be biased since I worked 2 summers on the lake’s shores, but hey, better to be biased and passionate than unbiased and write a shallow, uneducated guide for ya, right? The lake is ten miles long, one mile wide and 472 feet deep. Its frigid water is home to a variety of trout, including cutthroat, bull, lake and rainbow. Lake Superior whitefish, kokanee salmon and mountain whitefish also inhabit the lake, which is bordered by dense conifer forest. Grizzly bear, elk, black bear, moose and deer are commonly sighted in the area, particularly on the lake’s north shore. Snowmelt from McDonald Creek feeds the lake, emptying into the Middle Fork of the Flathead River. 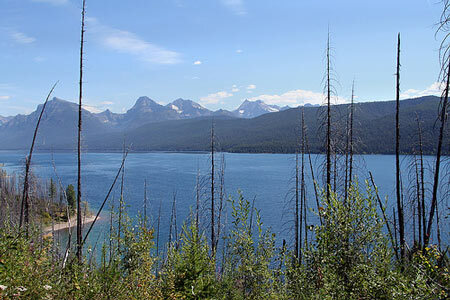 Hiking along the north shore of Lake McDonald is a great way to bask in the glory of its alpine splendor. The trail starts at the Fish Creek campground and meanders along the lakeshore for about 14 miles round trip. The trail is flat, making it an easy hike. A word of warning, bring mosquito repellent in summer, or you’ll get eaten alive by the little blood-suckers! Hiking the west shore of the lake is another option. Parking is available at Kelly’s Camp on North Lake McDonald Drive, just past the ranger station. The trail passes through a burn area from the Moose Fire of 2003 and runs along the lakeshore with spectacular views of the lake and surrounding peaks. Because the fire has taken out the trees, there’s little shade along the trail, so it gets pretty hot in the summer months. Prepare for the heat and bring lots of water. After about two miles, you arrive at a campground on the lake. Another four miles and you’re at a cliff area called Rocky Point, shortly before you reach the Fish Creek campground. 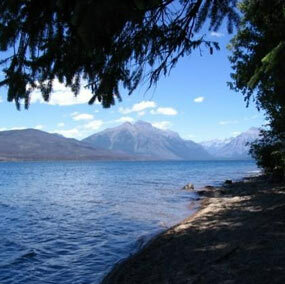 Camping options on Lake McDonald include RV and tent campgrounds at Apgar and Avalanche Creek. If you prefer a more solitary camping scenario that isn’t populated primarily with RVs, a tent-only campground is located at Sprague Creek. Learn more about camping in Glacier National Park. A National Park Service visitor center is located on the western shore of the lake in the town of Apgar with lodging and restaurant facilities. They also rent boats to visitors who want to get out on the lake. Five miles east of the visitor center on Going-to-the-Sun Road is one of the largest tourist facilities on in the park, Lake McDonald Lodge, with a variety of lodging options, including cabins, plus several restaurants, boat rentals, bus tours and guided hikes. Believe it or not, in my 2 years working at Lake McDonald, I never once hiked the trail. And I kick myself for it all the time. What a perfect early morning hike that would have been before an evening of working at Jammer Joe’s Pizza. But here’s the thing: As lovely of a trail as it is, there are better hikes in the region. For one, it’s long. Very long. If you aren’t in good shape, it could take you 8+ hours. Those 8 hours are better spent hiking Avalanche Lake and then heading north to Polebridge for a cinnamon roll at The Polebridge Merc. If you disagree, I’d love to hear your voice. I worked four summers at McD. I wouldn’t trade the experience for anything!